Another six pictures from 1985 for my Hull web site. They include pictures from Beverley Rd, Selby St and Springbank. 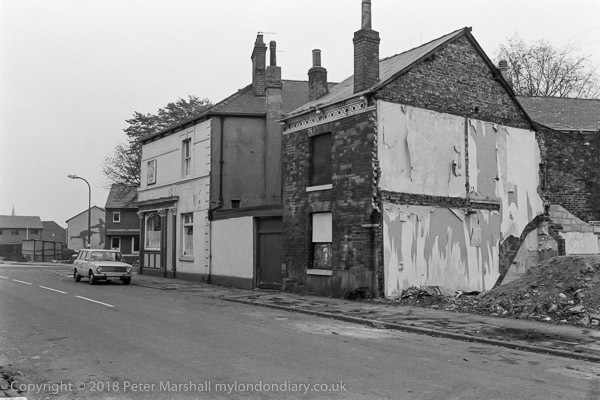 ‘Still Occupied – a view of Hull‘ now has over 530 black and white images I made in the city from 1973 to 1985. I am gradually adding the texts I have written about most of the pictures. Please feel free to comment here with any further information or corrections about these images. Back in 1892, 46 Beverley Rd was the home of dentist Zachariah Charles Blyth L.D.S.,R.C.S. Later he had a son, Joseph Charles, killed in 1917 in the Great War, and three daughters, Hilda, Violet, and Dora. 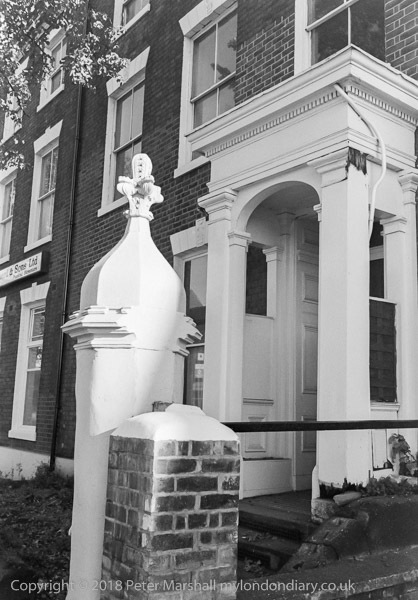 Presumably this house and No 44 were once a part of Kingston College, built 1836-7, , where a pair of similar gate-piers (which have lost the decorative top) still stand on Beverley Rd, flanking a path leading the the Kingston Youth Centre, which is set back a short distance from the road. It was perhaps built at the same time as the former College lodge at No 44 next door had its upper storey added. Much of Hull is below the level of the highest tides, and fairly large areas below sea level. The whole of the Hull basin had been subject to extensive drainage schemes since the early middle ages, with drainage ditches (known as drains or dykes) discharging water from low-lying areas into the River Hull at low tides. One of the older which came through to the Hull at High Flags was Setting Dyke, and after the Cottingham Drain was dug following an Act of Parliament around 1770 it joined to Setting Dyke between Ella Street and Victoria Avenue near the southern end of Newland Avenue. The combined drain, now known as the Cottingham Drain then continued east past Beverley Road before turneing south parallet with Beverley Rd to go under Norfolk St and then turn east again to meet the River Hull at High Flags. Cottingham Drain into the sewer on Cottingham Road. The filled in drains were grassed over, with much of their length becoming foot and cycle paths, and you can still follow most of their course on satellite imagery. 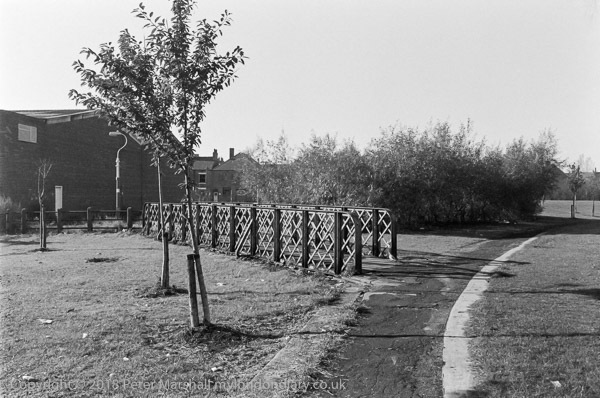 This bridge was left in place, in parkland somewhere near Bridlington Avenue. I looked for it briefly last year but couldn’t find it, but it may well still be there. 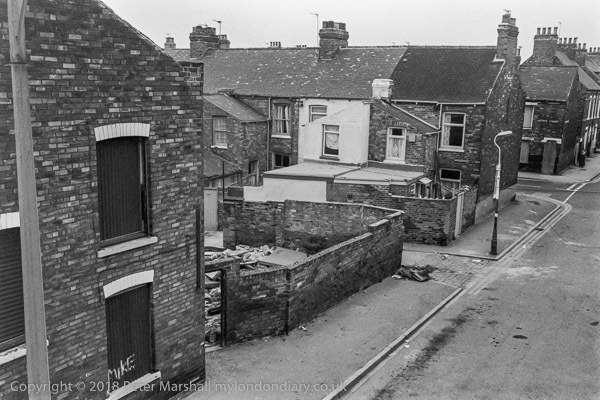 In the background of this image, on the side of one of the more recent houses you can see the image of a game of rugby league in the brickwork. You see this if you look out to the right as your train nears Hull, in Farnella Close off of Selby St. The picture was taken on Selby St and the pub on the corner of St George’s Rd is the nineteenth century St George’s Hotel. The nearer house has been demolished and the area became part of the pub garden. The pub became noted for its drag acts when the landlord was female impersonater Bobby Mandrell, “Hull’s Most Glamorous Landlady”. It closed in 2013, but was reopened in 2016 and shortly after changed its name to the Loud Mouth Count Hotel. 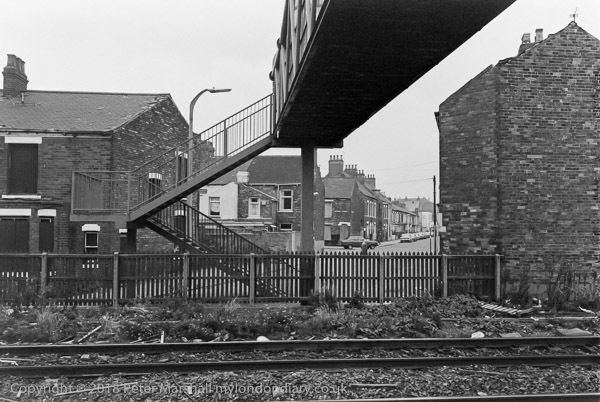 There is still a footbridge across the railway leading from Selby St to Walliker St, though both houses in the foreground and those on the far side corner of Arthur St have been demolished. That on the near side corner is still standing as are the lower houses further down Walliker St. THe large roofs in the distance were those of the now closed Charleston Club (a redevelopment opportunity) close to Anlaby Rd and other buildings on Anlaby Rd. Samuel Walliker (1821–92), born in Bury St Edmunds, was postmaster in Hull from 1863 until 1881 and lived at Ashburnham House on Anlaby Rd not far away. Walliker Street was laid out in 1881. Walliker, who had begun his career in London under Sir Rowland Hill, was also noted as a philanthropist. He moved to become Postmaster of Birmingham in 1881 (until he retired in 1891) and the following year set up The Society for Promoting Country Trips and Garden Parties for Poor Old People in around 1882, and was President of the Kyrle Society (Window Gardening Section), an organisation founded in 1878 to provide window boxes for slum dwellers. He had a song composed about him around 1871, ‘The Hull Postmaster’ published as sheet music celebrating the opening of a money order office and savings bank in Wellington St, to the tune ‘The Arethusa’, also known as ‘The Saucy Arethusa’, a well known folk tune dating from around 1700. Unfortunately I’ve been unable to find the words of ‘The Hull Postmaster’. The house at left of the picture has been demolished and this is now an area of green space with a footpath. The nearer houses on Arther St are still standing, but those beyond have been demolished and recently replace by a new block of what looks like sheltered housing. 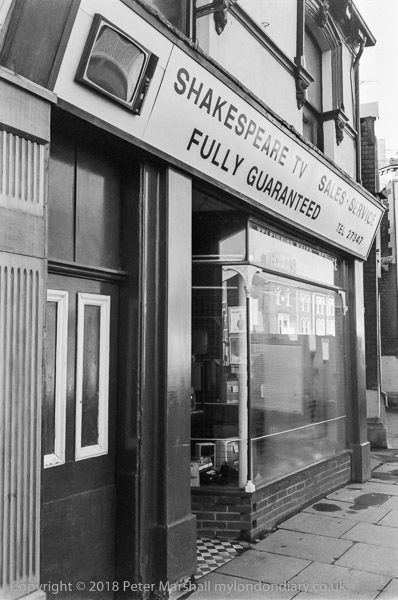 Shakespeare TV was at 177 Spring Bank, now the Adonai Food Store, next door to the Swedenborgian Church, built in 1875 as the New Jerusalem Church or Swedenborgian (New Jerusalem) Chapel, which was for some years after its closure as a church 9in 1948 a second-hand furniture showroom, Bargain Centre & Removals but is now the ICF Church, and the red brick visible at the right of the picture has been painted cream. Clicking on any of the above images should take you to a slightly larger image on ‘Still Occupied – a view of Hull’. This entry was posted on Sunday, April 15th, 2018 at 09:54 am and is filed under Hull Photos, My Own Work. You can follow any responses to this entry through the RSS 2.0 feed. You can leave a response, or trackback from your own site.